Using only mathematical calculation (celestial mechanics), this man predicted not only the existence of the planet Neptune but also its position in the solar system. This genius of celestial mechanics was Urbain Jean Joseph Le Verrier. Urbain Le Verrier was born in Saint-Lô, the capital of the department of Manche, Normandy, in France. Le Verrier began his studies at École Polytechnique in Paris. Here his initial interest was in chemistry, with a particular focus on the combinations of phosphorus and hydrogen, and phosphorus and oxygen. But it wasn't long before he discovered his true passion, celestial mechanics. At the completion of his studies he accepted a position at the Paris Observatory. It was here he found his vocational home, eventually taking the prestigious position as the institute's Director twice, the first time from 1854 to 1870 and the second from 1873 until his death on 23 September 1877. Le Verrier's true claim to fame came in September of 1846. After spending months absorbed in deep calculations to try to understand the discrepancies in the orbit of Uranus, Le Verrier predicted the existence of another planet that was causing said discrepancies. Le Verrier immediately sent his predictions to Johann Galle of the Berlin Observatory. And on 23 September Le Verrier's predictions were confirmed when the planet was found by Johann Galle. It was, amazingly, found to be within just 1° of Le Verrier's predicted location. Interestingly, at the same time a man named John Couch Adams in England was doing similar calculations. In fact, to this day there is still controversy over which man predicted first! It is perhaps also worth noting that Le Verrier is one of 72 people to have his name inscribed on the Eiffel Tower. On 17 February 1958 France issued a set of four stamps celebrating famous French Scientists. Two stamps in this set were designed and engraved by Albert Decaris. Click HERE to see my blog post on Joseph-Louis Lagrange. 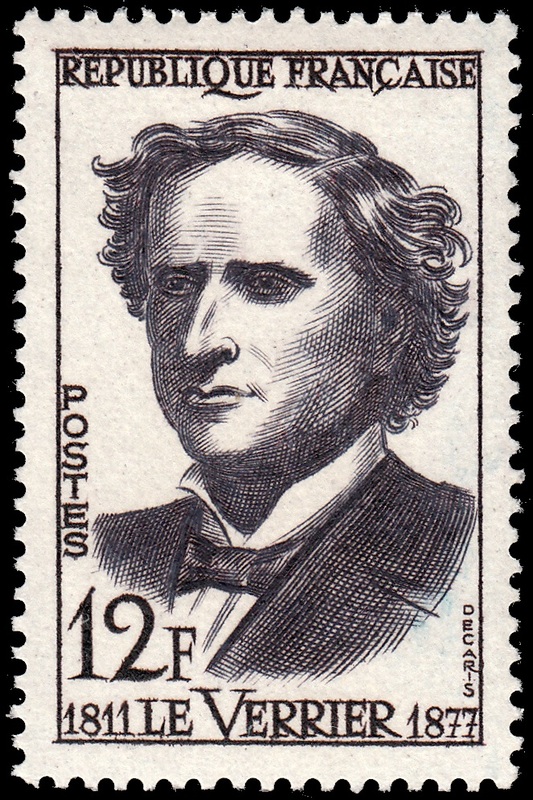 The second stamp designed and engraved by Decaris features Urbain Le Verrier. In this stamp, Decaris has captured the intensity and complexity of this astounding scientific mind. A fitting engraved tribute to Le Verrier by the master, Albert Decaris.